March 24 marks 20 years since the start of NATO’s aggressive military campaign against the Federal Republic of Yugoslavia. The war was unleashed by Western countries under the pretext of “forcing” the Serbian leadership in Belgrade “to peace” with armed Albanian separatists, who revolted in the autonomous province of Kosovo, which was part of Serbia. The deputy head of the Center for the Analysis of Strategies and Technologies (CAST), military expert Konstantin Makienko, discusses the political and military results of the “last European war”. The NATO rally against Yugoslavia in 1999 was the first case of a direct large-scale military operation under the direct auspices of the North Atlantic Alliance, as well as the first interstate armed conflict in Europe after World War II. 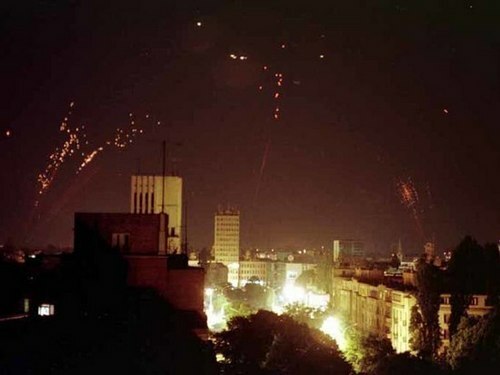 The Yugoslav campaign of 1999 became an important stage in the development of modern means of warfare, demonstrating the possibilities of a large-scale air offensive operation carried out without direct action by a group of ground forces. At the same time, the NATO air operation was carried out mainly with the use of high-precision guided weapons, marking the final transition to the rule of high-precision weapons in the arsenal of modern military aviation. In total, the West has used up to 10,000 controlled weapons in Yugoslavia. Since the war of 1999, all subsequent air operations of the leading states of the West have been carried out almost exclusively with the use of precision weapons. In the course of the 78-day air operation, dubbed the “Allied Force”, the West won a complete victory and eventually fully achieved the goals that it set for itself – though not at the expected speed. These goals are the withdrawal of Yugoslav forces from Kosovo and the further weakening of the Serbian “remnants” of the former Yugoslavia. The regime of Serbian President Slobodan Milosevic did not survive the loss of Kosovo and fell in 2000 already. The new leadership of Serbia and Montenegro headed for rapprochement with the West. Kosovo itself in 2008 proclaimed full independence, quickly recognized by leading Western countries. All this was achieved by the NATO countries at the cost of minimal losses and costs – including just two American military planes shot down by the Serbian air defenses (F-16CJ and stealth fighter F-117A). The United States and NATO have once again demonstrated their political will and desire for complete military dominance, combined with the ability to quickly and effectively deploy and use their military potential. The Alliance’s promotion of moderate and limited political campaign goals — NATO did not set out to invade and occupy Yugoslav territory, or even change regime — was relatively quick to force the enemy to retreat. Thus, the main lesson of the events of 20 years ago in Yugoslavia is that modern air power has shown the ability to fully determine the outcome of a modern limited war. The experience of the 1999 campaign clearly showed that such modern air power can only be resisted by its own significant and technically advanced military aviation and air defense capabilities. Weak and technically backward Yugoslav air defense, frozen in development at the technical level of the mid-70s, with outdated C-125M and Kub-M anti-aircraft missile systems, old radars and just one squadron of MiG-29 fighter jets (also in simplified export equipment) could not seriously resist the modern massive air strike of Western countries. She suffered serious losses with minimal results. The Yugoslav air defense forces were forced to go to the ambush-partisan “wandering” actions aimed more at saving their money and people than to inflicting damage on the enemy, and as a result were able to achieve, in fact, only half-case successes in the fight against NATO aircraft. The use of ground-based air defense systems in any case deliberately gives the initiative into the hands of the enemy’s aviation. An important conclusion of 1999 was yet another proof that it was precisely combat aircraft that should become the main means of disrupting the enemy air offensive. Only an active struggle for air supremacy by the forces of its own fighter aviation can radically complicate the situation for the enemy in the sky. This means that our combat aviation must be in quantitative and qualitative terms at the level of aviation of the advanced NATO countries. This requires that Russian military aviation be adequate to the highest modern technical level requirements of the aircraft themselves, their engines, radars, weapons, communication and control systems. The large-scale process of re-equipment of the Russian military aviation in the last decade has significantly increased its technical and operational level, which clearly demonstrated the successful use of our air and space forces in Syria. However, this cannot be stopped, since the most advanced opponents of the Russian aviation are the most advanced powers led by the United States, which demonstrated their air power in Yugoslavia 20 years ago. The Yugoslav lesson shows the full price of a possible military-technical gap from these powers. Russia does not have the right to such a lag.